The Domier HM3 lithotripter was used to treat 55 stone events in 44 pediatric patients. The mean patient age at treatment was 11.3 years, with the youngest patient being 13 months of age. 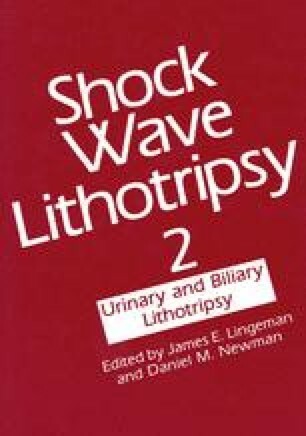 Sixty-two extracorporeal shock wave lithotripsy (ESWL§) treatments were necessary for the 55 stone events at a mean of 1,186 shock waves (range, 250 to 2,100) at 19.6 kV (range, 16 to 26 kV). Follow-up was available for 95% of the treated stone events; 79% were stone free at three months, and 83% eventually became stone free. Risk factors for retained fragments in the pediatric population appear to be similar to those for adults. Renal growth of 14 treated renal units in 12 patients has been unimpaired after ESWL treatment.